CIVA is a powerful and easy to use tool, but discovering all of its numerous possibilities may take you some time. That is why we offer you here all the CIVA Tips we published in our Newsletters, to help you master it faster! 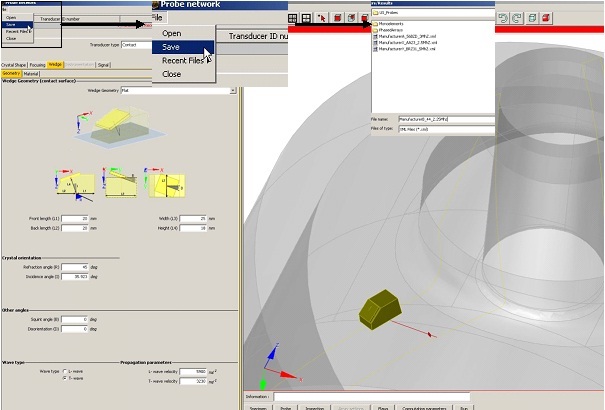 CIVA allows FMC acquisition or simulation post processing with the TFM algorithm. For this, the user must define a region of interest (ROI) where to perform the TFM reconstruction by defining the dimensions, the pitch of the grid and the position of the ROI in the specimen. If the ROI is the same for several files, it is not necessary to define the zone each time. It is possible to save it and load it before post-processing. To do this, once the ROI is defined for a configuration, click on "File" and "Save". An *.xml file is saved in the desired location. Then, it could be used for another post-processing by loading it via the same panel. CIVA Analysis or CIVA UT can load acquisition data, in order to perform your analysis works and prepare examination reports using the powerful tools available in CIVA software. You probably know that CIVA can directly load M2M Phased-Array systems data files (MultiX, Gekko, etc.) as well as Olympus ones (opd, oud, rtd) in their native formats. But CIVA is very flexible, and also offers the possibility to read other types of data through "PlugIn" solutions. You can first export your acquisition data into a text file, right from your acquisition or analysis software. Then you will use the "CIVA files (txt)" PlugIn to import this text file inside CIVA. Or you directly load the native data file inside CIVA. The process is quite fast in this case, as this PlugIn is already fully defined. You just have to organize your data file so that this plugin can properly read and load it in CIVA. The document "Import plugin UT CIVA.pdf" describes the way data should be organized. It is basically a simple header, and then a classification of temporal signals data in columns following the so-called "IBST" order (I: Increment; B: Scanning; S: Sequence (in case of electronic scan); T: Shot (in case of multiple focal laws, such as sector scan for instance)). Once your file is properly set, just call it from the CIVA file manager or the desk through the load button. This PlugIn is called ImportUTDataFile. In that case, some more work has to be done thanks to the Development kit provided. Developing a DLL (Dynamic Link Library): The role of this DLL is to provide all information to convert your UT Data Format to a CIVA native format. CIVA provides a full development environment compatible with Visual C++. Setting two XML configuration files (*.xml description of input and *.xml description of PlugIn), to help CIVA interpret your DLL. Setting a ".bat" file that will contain some runtime settings, and will constitute the PlugIn launcher. You can start your implementation by using the example available, "SampleImportPlugInDll.plugin", and then progressively adapt it to your own files. You can contact us to help you in that process, either through the support service if you handle this development but that you have specific questions, or through a full consulting service if you wish us to develop the PlugIn for you. For the RT technique, the interpretation of results depends on human eyes. The difficulty is that the interpretation can vary from one person to another depending on perception. 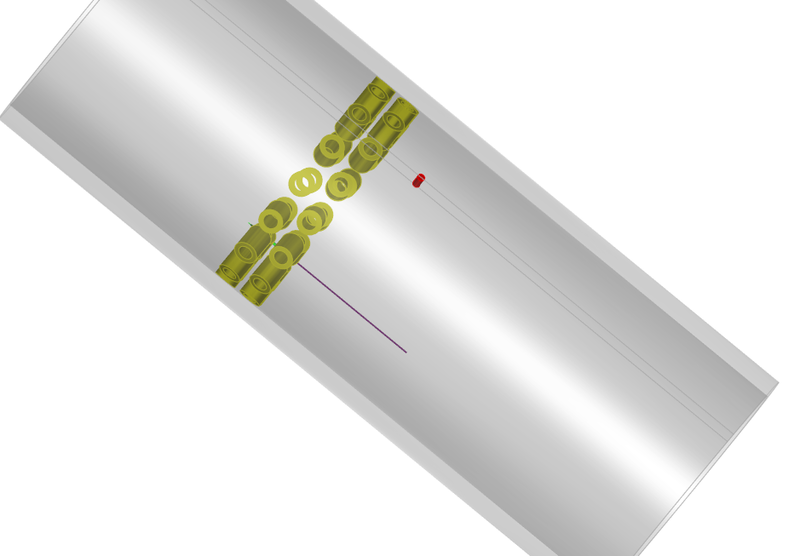 In order to help the user and allow automatic measures (for POD calculations for example), three criteria were implemented in CIVA to evaluate the detectability of defects. Those criteria are based on comparisons of contrast to noise ratio on the images with and without flaw. The first one, "Pseudo Rose", is inspired from the work of Albert Rose, and is adapted for roughly circular flaws. The second one, "Ellipse", was developed for silver film; and the third one, "Fushia", is based on the "Pseudo Rose" criterion and is adapted for elongated defects. To use those criteria, don’t forget to tick the "Simulate images without flaws" option from the "Options" menu, "Computing" tab before launching your calculation. In the analysis page, select the "Response detector noise" image, then select the "Detectability" menu (bottom of the analysis window). Then click on the "+" button and select an area of measure. By default, the Rose criterion will be displayed. This can be changed by clicking in the "Detectability" menu. With the Rose criterion, a defect is considered as detected when it has a value above 7. You will find more information about those criteria in articles available on our website and in the CIVA user manual. Since CIVA 2017, a probes library is available in CIVA. This library contains a number of commercially available probes and is already included in CIVA. Thus, the user saves time in the preparation of their configurations. If you are used to working with specific backup folders to store your CIVA simulation files, you will certainly appreciate this tip. Then, by using the small "+" icon located at the top right of the screen, you just have to define as many Bookmarks as you want. 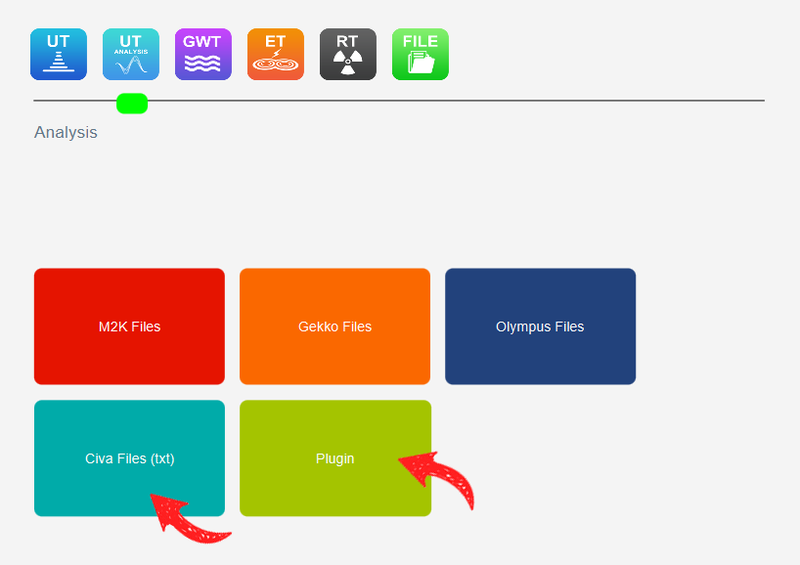 They will appear directly on the Desk's right hand side, on the right of the file history (recently uploaded files). All you have to do is to click on one of the folders to directly access the simulation files it contains. 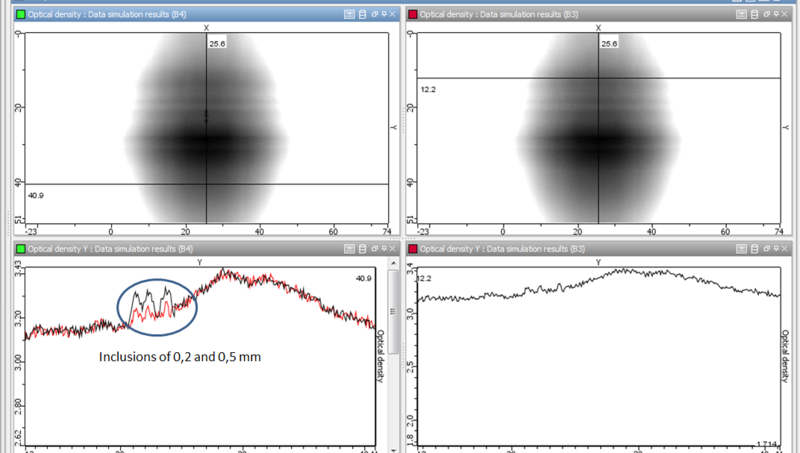 In order to apply a DAC (also called TCG: Time Corrected Gain) to results obtained from a parametric study one time only, it is necessary to do a post-processing of the data. 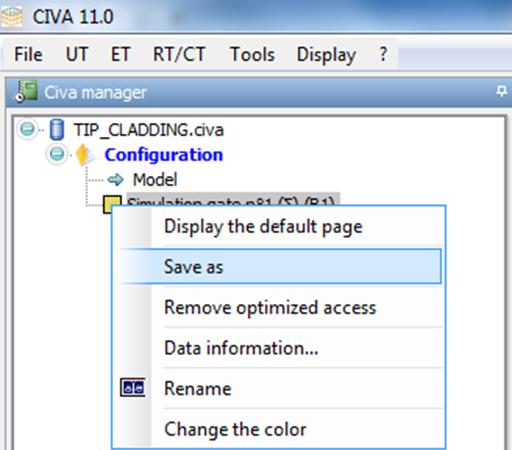 To do that, do a right-click on the data in the CIVA manager, then select "Edit VAR parameters". 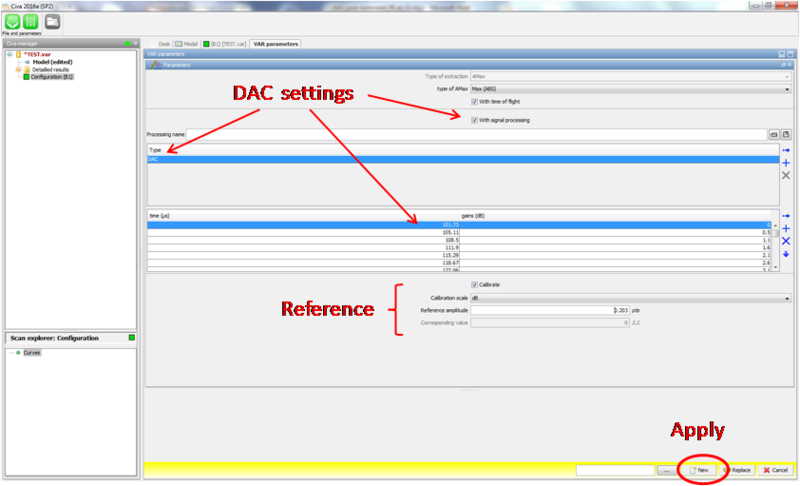 In the new page, define a DAC "signal processing", fill the corresponding chart in (time and gains), then click on "New". It is also possible to define a reference amplitude (for example, the maximum amplitude of the DAC in "points", arbitrary unit in CIVA) in order to obtain the results directly in dB. Time and gains data would have been obtained from a previous simulation with calibration reflectors at different depths. This signal processing can be saved also in this window, don’t forget this option which will allow you to load it in one click in a future case ! Once these steps are done, a new page appears in which the data are shown in dB and by taking into account the DAC. If you often simulate the same detectors or sources, you have the possibility to save them and reload them in others CIVA configurations. This can allow you to build your own library of sources and detectors, and to avoid making some mistakes when entering input data in CIVA. This is not a new feature in CIVA, but it remains very helpful! Once you have filled in all the information in the selected panel (detector in that case), just select the "File" menu, then "Save" on the top left side of the panel. By doing this, you will save the geometry of the detector, but also the material of the sensitive layer, and the filters if you have defined any. When you will define the same detector for another configuration, just load the *.xml file containing all the data from the same place with the "Open" menu. Don’t spend any more time modeling it! This feature is also available for other panels (component, flaw, IQI...). Since the version 2016 of CIVA, it is possible to perform an ultrasonic field computation taking into account several reflections on the boundaries of the specimen. Indeed, the user can define the number of reflections taken into account by CIVA in the computation. 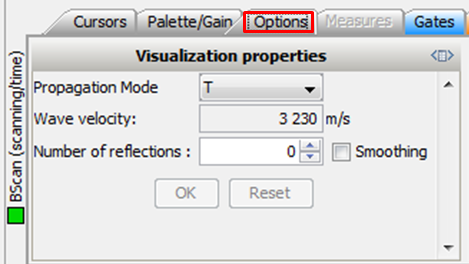 This setting can be accessed from the "Simulation settings" panel under the "Options" tab. By default, only the direct mode will be computed by CIVA. 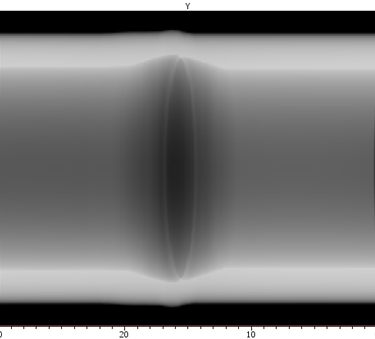 This corresponds to the direct path of the ultrasonic beam. 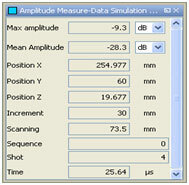 By activating the “Specimen’s boundary reflection” option, it becomes possible to define the ultrasonic path to be taken into account in the computation by defining the number of reflections. It is also possible to check and specify the modes that will be computed by CIVA by selecting the "Specify mode list" option. The list of computed modes now appears in the interface. Using the right-click on a particular mode of this list, it is possible to remove a mode from the computation. The modes list can also be imported from a text file. To do this, the file must contain, on each line, the mode to be taken into account. The nomenclature of the modes is shown in the example below (example with T wave and reflections on the backwall and the surface). There is no special header on this file. Then, this modes list can be imported using the “Load” command. 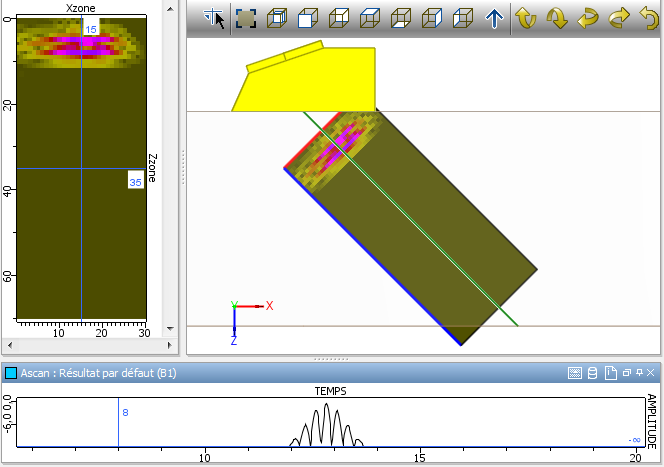 It is possible to import 3D CAD in CIVA in order to simulate the inspection of a specimen with a complex geometry. However, when inspecting a part of the mock-up that is not 3D, it is easier to use 2D CAD. The calculation time is reduced and more calculation options are available, in particular those regarding geometry echoes. To simplify the transition from an existing 3D CAD to a 2D CAD, it is not necessary to draw the specimen in the CAD editor of CIVA. Simply display a section view of the 3D CAD, right click on the specimen, and select "Component", "Export Profile to .dxf". 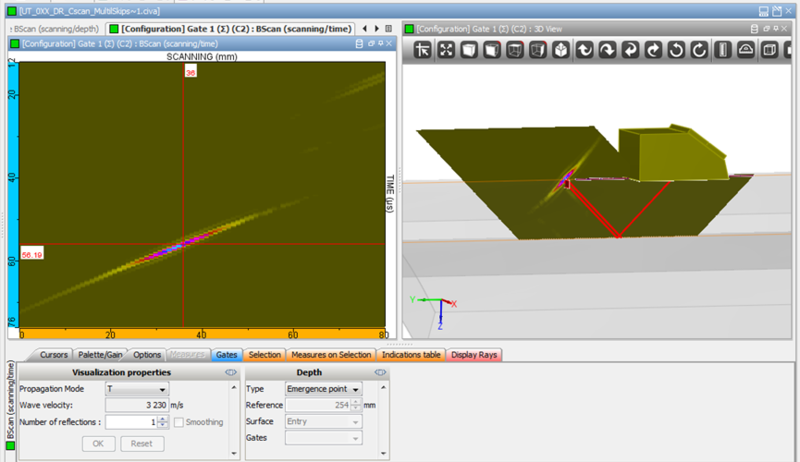 The *.dxf profile that has been saved can then be imported into CIVA. 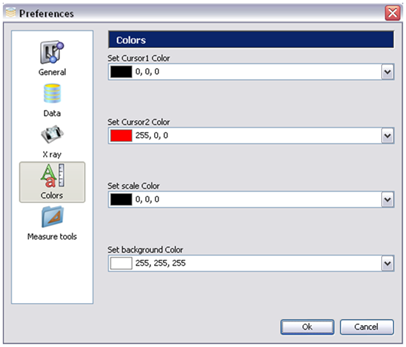 Before launching calculations, you must reassign the right colors to the specimen surfaces, since all segments of the saved profile are in comment after the export. What happens now if the flaw is an outer breaking notch, and a “full skip” option is required to correctly model the configuration? As visible below, the reconstructed B-Scan in the 3D view displays by default the main corner echo of the flaw outside the specimen. 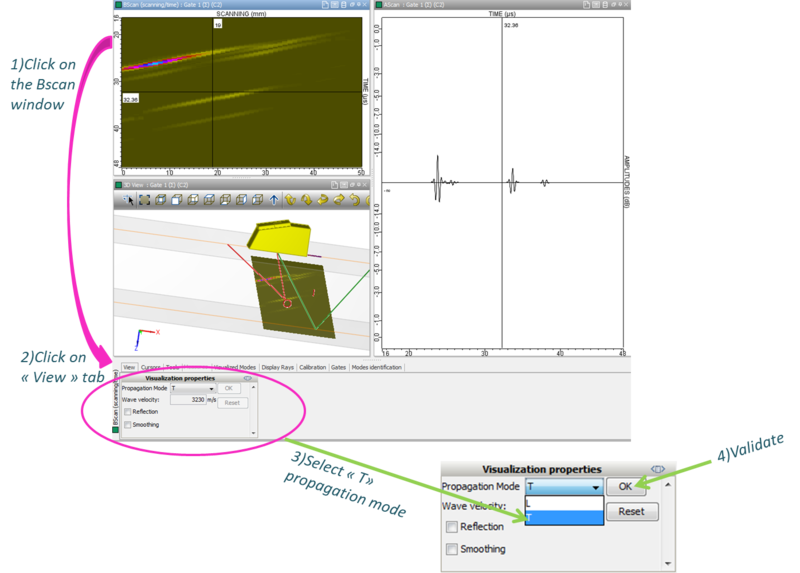 From the tool box, in the Options tab and in Visualization properties, by selecting the number of reflections, raypaths can be reflected after reaching the backwall or the surface. The true view in this case is the sum of a direct and a reflected image. 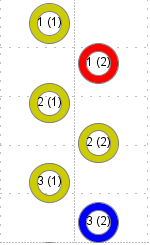 It is then possible to choose the number of skips wanted to account for in the image, and simply click on “OK” to apply. A reconstruction with one reflection is displayed below. Multiple skips reflection is also possible with a large number of reflections. 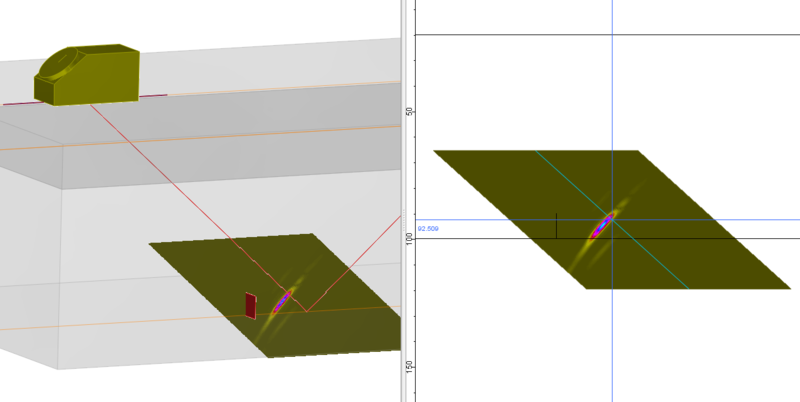 The left image displays the default reconstruction, while the right one includes two reflections in the visualization properties to enable a visualization of the corner echo at the correct position. In some cases (inhomogeneous and/or anisotropic configurations), the reconstructed views are badly shaped. For example, the data are superimposed or some "holes" appear. These phenomena are clearly visible on the second image below. 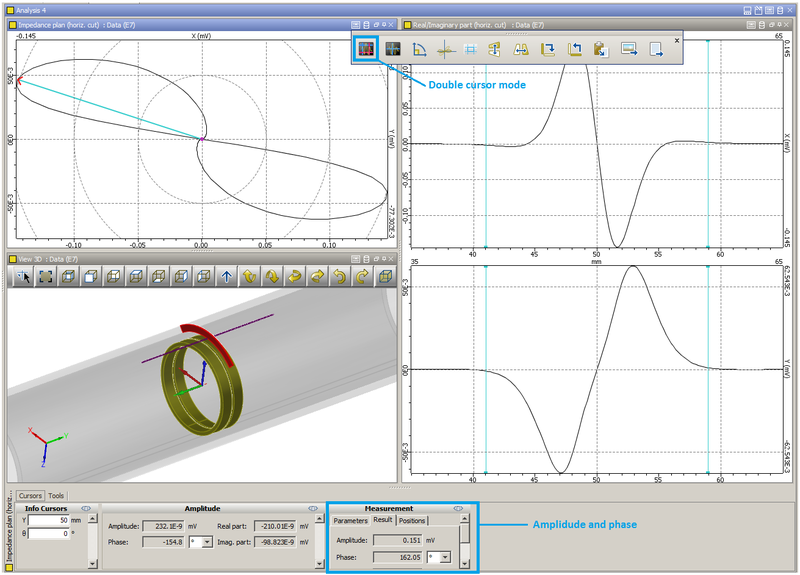 The configuration simulates a weld inspection by using a sectorial scanning; the weld is defined in different anisotropic volumes with a particular crystallographic orientation, and the porosity is modeled by a spherical flaw. These behaviors are due to the fact that data is reconstructed along a path based on the central ray and, in some cases, this ray can be locally affected (e.g. : particular incidence compared to an interface, impact point of the ray on a junction between several interfaces, etc.). In order to bypass this problem, the "Smoothing" option is very useful. It is located in the toolbox at the bottom of the screen. Compared to the left view of the second image above, the use of the "Smoothing" option gives a much better reconstructed view. With Civa 2016, many improvements have been made in the description of Eddy Current array probes. 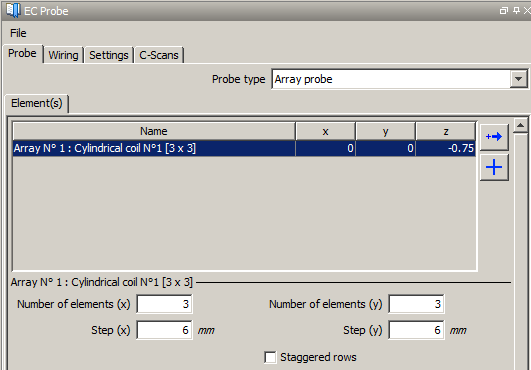 Indeed, it is possible to define this kind of sensor using an array probe editor, available by selecting the "Array probe" type. For this kind of probes, one or more layers can be defined. Each layer can contain a different number of elements, and a different type of coil. The editor makes it possible to define all these parameters in a few clicks. Wiring can be defined in several ways, such as "All elements on the same cable" or "One element by cable", or even in a more complex way thanks to an expert mode giving access to a wiring editor. The acquisition channels (common functions, separated functions) can be defined very easily by describing a basic pattern gathering the active coils together and their role (respectively driver coil, Pick-up coil, Driver-Pick-up). They will appear in the editor with a clearly identifiable color (respectively red, blue and pink). The electronic scanning can be defined on the whole sensor with a sequence editor (automatic or manual path). Several channels can be defined in a single simulation. A mechanical scanning can be associated with the electronic trajectory. The C-Scans enabling the visualization of the different channels are then defined. One C-Scan per channel is available, other C-Scans can be added by the user before running the solving process. The results corresponding to the defined C-Scans are available after the solving process. Regarding the tube inspections, the "X-probe like" type of array probes can be defined. 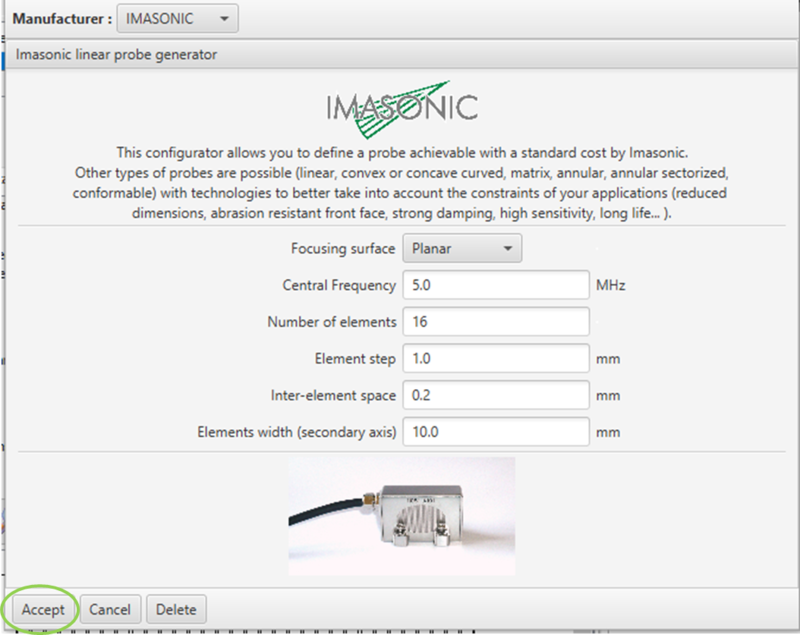 For this type of probe, the settings is predefined in the interface. 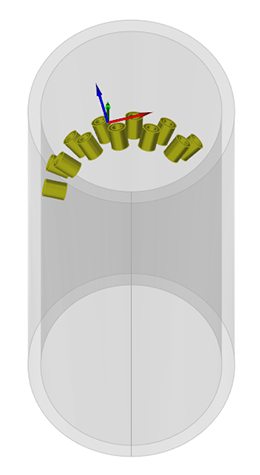 The probe can cover the whole tube's circumference by selecting the 360° option, or only a part of the tube without this option. The general properties of the array probe (number of rings, number of elements per ring, distance between the rings, lift-off, ...). 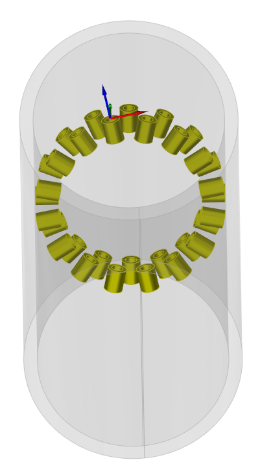 Dimension of the coils which compose the probe. 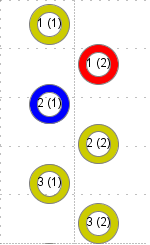 3 patterns as well as the electronic scanning are defined automatically and can be seen from this dedicated interface (driving coil in red, pick-up coil in blue). A mechanical scanning can also be associated with this array probe. By default, two C-Scans are defined before the solving. 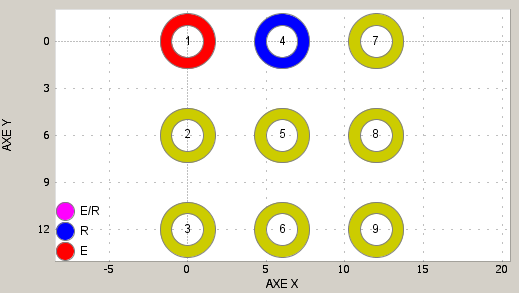 Both channels can be analysed after the computation: one corresponds to an axial detection and includes both axial patterns, and the other corresponds to a transverse detection. If necessary, other C-Scans can be added by the user. After computation, the results are available for the different C-Scans which have been defined before running the solving process. 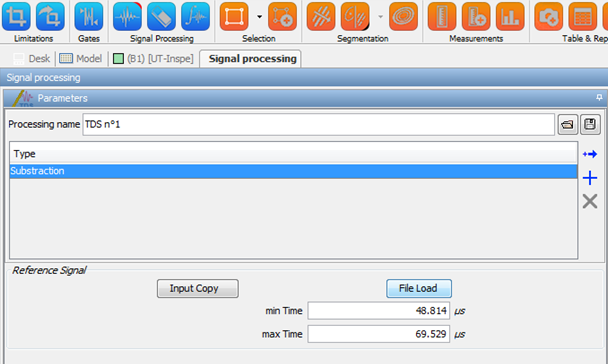 Since CIVA 2015.a, the subtraction between two signals is available from the "Signal processing" icon in the analysis bar. Clicking on this icon opens a post-processing window, with the "Envelope" processing type defined by default. To access to the other processing types, click on "Envelope", and the whole list will appear. Select "Subtraction" and the appropriate window opens. Now, as in the previous CIVA versions, you can directly delimit the signal to remove on the reference signal A-scan. The output signal A-scan will be interactively modified. Then click on “Apply” and then on “New” to open the new analysis window with the output signal A-scan. In the example below, the lateral wave is removed from a TOFD inspection A-scan. It is also possible to load a reference signal in a .txt format and apply the subtraction of the whole reference signal, or only a part of it, by modifying the "min Time" and "max Time". 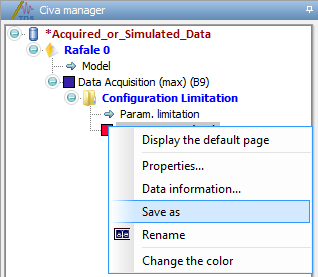 Different options can be selected in CIVA to optimize an RT configuration and reduce the time of calculation or the memory size of a configuration. First of all, a Region Of Interest (ROI) can be defined. To define it, select “Use ROI” from the Options panel / Detector tab. The region of interest is a small rectangular region within the film which is sub sampled to obtain a finer resolution. Select the “Up scaling” factor in the drop-down list. By selecting a refinement factor of 2, the surface of each pixel in this zone will be refined by a factor of 4, which means a significant increase in convergence rate. 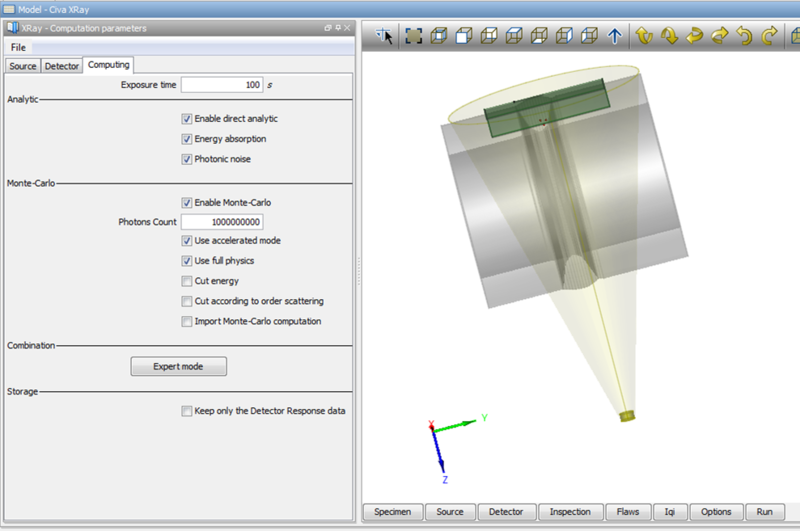 The ROI appears on the detector in the 3D view. 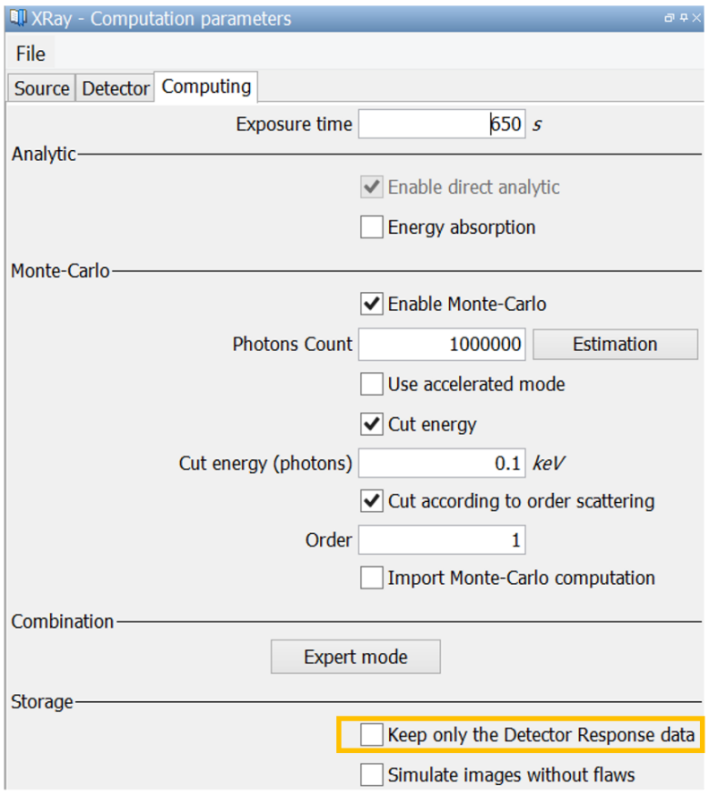 Secondly, options of the Monte-Carlo calculation available from the Options panel / Computing tab can be modified to reduce the time of calculation. 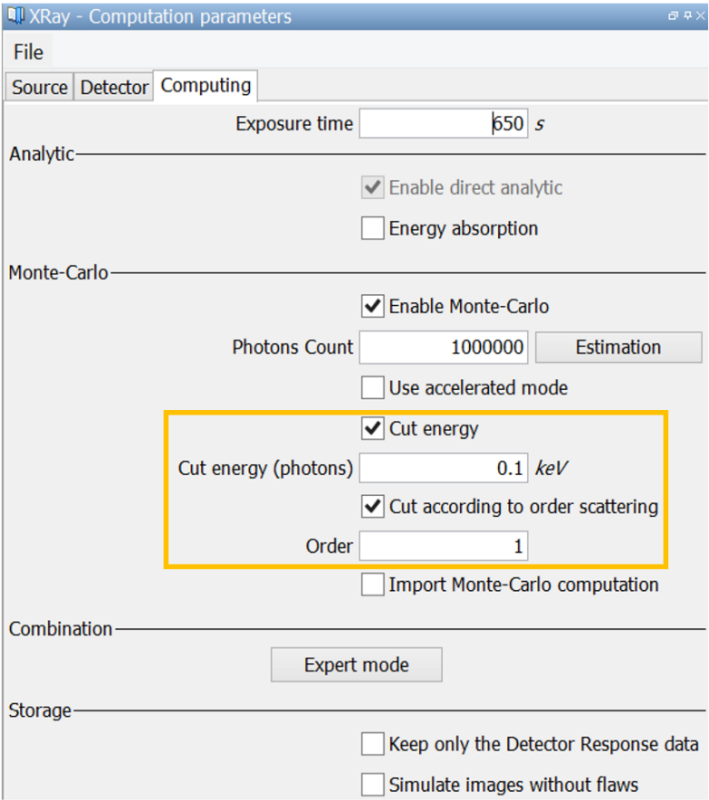 Cut energy: By ticking this option and keying-in a value of energy, photons with incident energy lower than this given value will be automatically killed. This option reduces the computation time. Cut according to order scattering: By default, CIVA can simulate up to 10 orders of scattering for a given photon. This option allows you to stop the propagation of the photon if it has reached the number of order scattering defined. 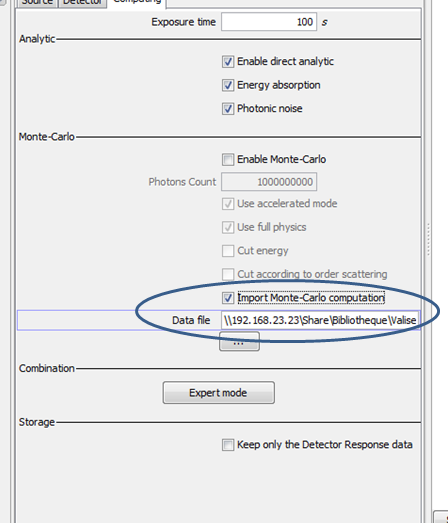 Import Monte-Carlo computation: For more information about this option, look at the tip “RELOAD AN ALREADY COMPUTED MONTE-CARLO” available below. Thirdly, it is possible to optimize the utilization of the computer for the calculation, by modifying the Preferences (top left of the CIVA window). A Monte-Carlo calculation is sequenced in multiple cycles, for which it is possible to define the number of photons considered. By default, a cycle is composed of 100,000 photons. By increasing this value slightly, it is possible to reduce the number of cycles that will be calculated for a given number of photons to be simulate, and thus to save time. This option is available from the X-ray tab of the Preferences. Combining BL and Monte-Carlo calculations generates lot of images that are not always useful for the user. When the user doesn’t need to see those results, it is possible to select the “Keep only the Detector response data” option. By doing so, only images from “Response detector” or “Optical density” will be stored, and the memory size of the configuration will be significantly reduced (especially for CT configurations, for which results can exceed 100 Go of memory). By default, the variation curve of an extracted quantity (Amax for example) is a function of one of the varying parameter in CIVA points. 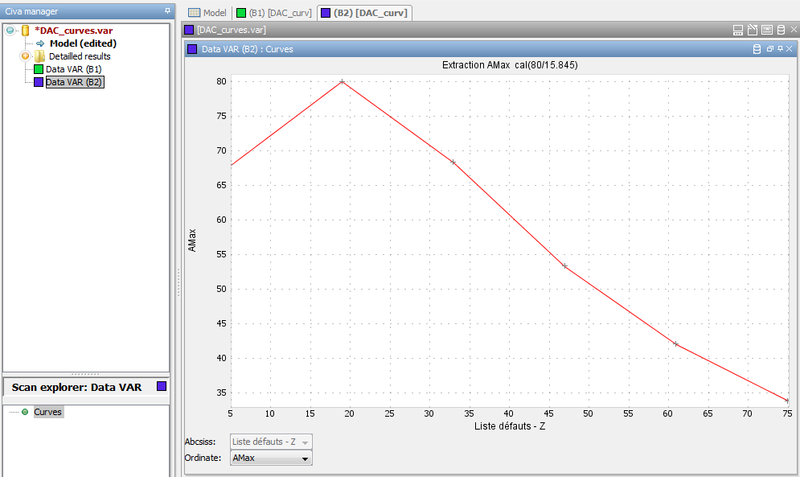 It is possible to calibrate the curve according to a reference chosen by the user in order to display it in dB or %. 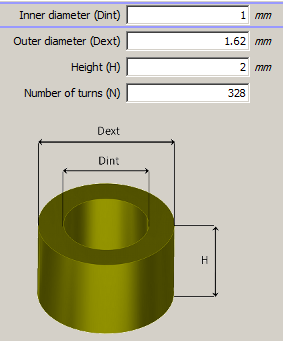 To do so, in the CIVA manager, right-click on the result and edit the variation parameters. A new window opens where you can tick the option "calibrate". 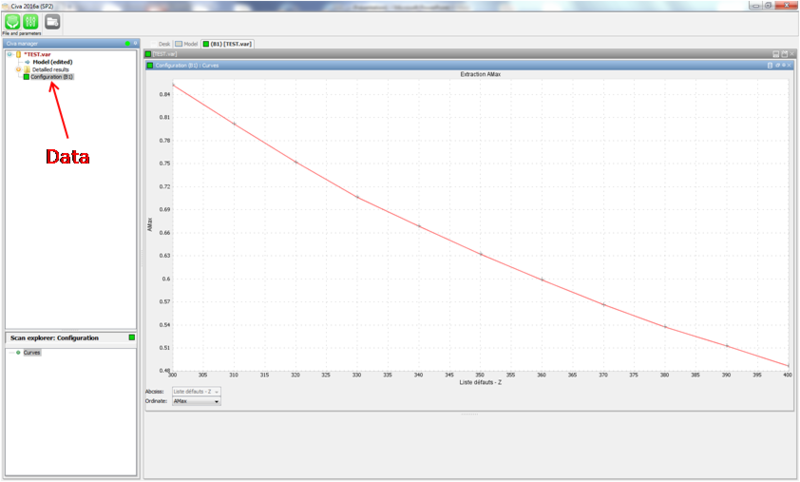 Then, you have the possibility to choose between a calibration in dB or in % (linear scale). According to the chosen calibration scale, you have to specify the reference amplitude (for dB scale) and the corresponding value (for linear scale). In the example below, the reference amplitude corresponds to the highest Amax value in CIVA points, and the corresponding value relates to the percentage it will be associated with after calibration. Click on the "New" button at the bottom of the window. The calibrated result is then displayed in a new window and appears in the CIVA manager. One of the most complex parameters to define in the RT and CT modules of CIVA is the number of photons that are used for the Monte-Carlo modelling algorithm. This number must be high enough to get a relevant and realistic result (as for other statistical models, it requires a significant number of photons to be computed to obtain reliable results), but too many photons will make the computation time prohibitive. Since CIVA 2015, an estimator of the minimum number of photons to be simulated has been included, to help the user in preparing the configuration. This option has been developed to choose an adapted number of photons for each configuration. We can clearly see that the result is not satisfactory, as most of the pixels on the detector were not impacted by any photons. It is nearly impossible to recognize the irradiated object: not enough Monte-Carlo photons have been simulated to converge towards a correct result. 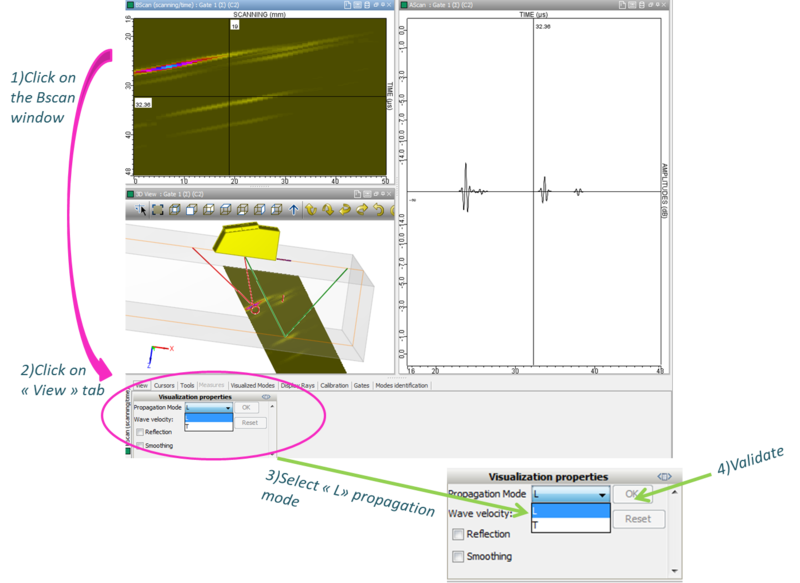 Without this estimator tool it is therefore necessary to relaunch as many simulations as needed increasing the number of photons to be simulated till a relevant result is achieved. A click on the “Estimation” button launches a quick Monte-Carlo simulation. At the end of this simulation, CIVA proposes in the GUI a number of photons to consider in order to perform a correct simulation. This time, we can clearly see that we obtained the expected result. The irradiated object is clearly seen, as well as the ellipse. This tool is really beneficial to help the user in defining the number of minimum requested photons to get an accurate result. We really hope you will enjoy this new capability of CIVA 2015! 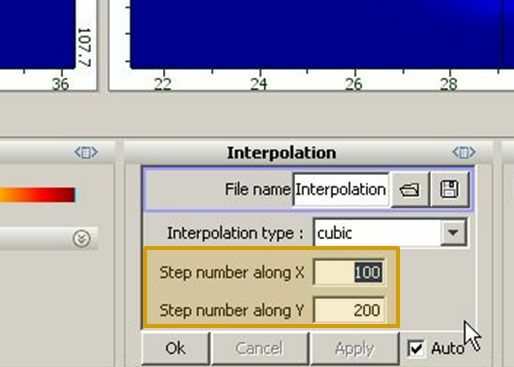 CIVA UT is able to automatically define the sampling frequency of the probe signal. But what does this option imply when the central frequency is modified during a new post-processing? The answer is in this video! Whatever your application domain, it is often necessary to handle on one hand some parameters in inches, and on the other hand some parameters in mm. The conversion is obviously not a big issue, but we wanted to make things easier for CIVA users and allow them to directly input one unit or the other in their CIVA modeling configuration. Thus, since CIVA 2015, the CIVA Graphical User Interface allows keying in any numerical parameter in inches instead of mm. And this is very easy to do, once you know the trick! As you can see on the screenshot hereafter, keying in a pipe diameter in inches just requires to use the “i” letter just after the expected value; e.g. you can key in “20i” to set a 20 inches OD tube. 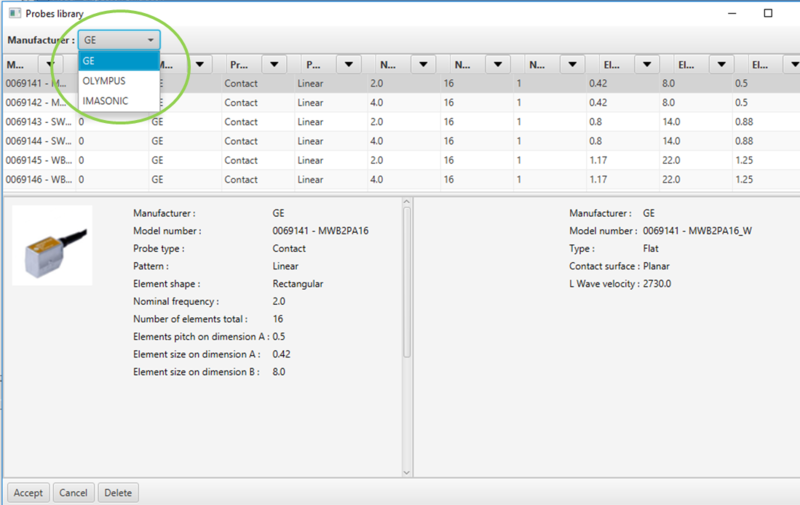 When validating the value by pressing “Enter”, CIVA automatically makes the conversion and displays the value in mm. A tooltip is visible when moving the mouse on the numerical value, giving you at any moment the value you defined in inches. The GUI is now even more powerful, you can also use mathematical common operators (summation ”+”, substraction “-“, etc.) and other common symbols such as the “fraction” one, which can be very useful when defining the size of the probe crystal as illustrated on the next screenshot. As for real inspections, a simulation project needs to be properly calibrated versus a reference flaw to provide meaningful results. CIVA includes the tools to define such calibration reference. 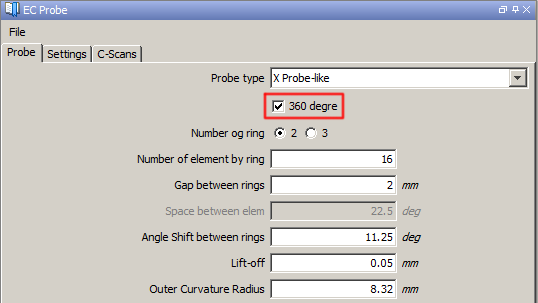 This Tip focuses on how to calibrate a result in the Eddy Current module of CIVA. The first step is to describe the reference flaw (as a calibration mock-up) and to simulate its signal in order to compute the relevant calibration gain and phase rotation coefficients to create the reference signal defined in the procedure. Once done, this coefficient will be used to calibrate all simulation works that the user wishes to relate to this reference. To do that, just follow the steps described in our video. 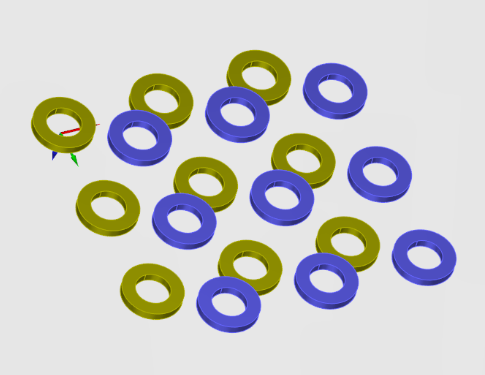 In CIVA, it is possible to make a simulation with heterogeneous components, and even anisotropic materials. 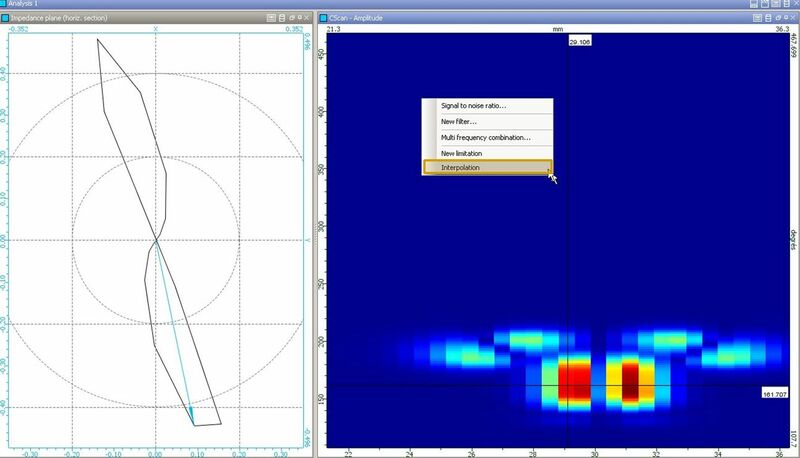 In this video, we show how to easily define the materials parameters of an heterogeneous component. CIVA 2D CAD editor needs some rules in order to understand the specimens, in particular linking the elements by their extremities. It is sometimes difficult to link segments and circles arcs since the exact coordinates of the connection point are generally unknown. 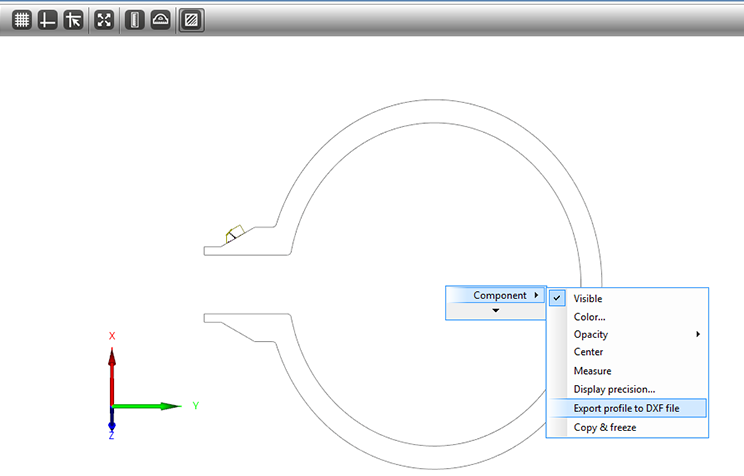 The "Adjust" feature of the 2D CAD editor enables the user to easily connect the elements. In ET inspection, we are often interested in the impedance variation of the probe in the complex plane. This signal is characterized by its amplitude and its phase. In CIVA, it is possible to activate the cursor mode which enables the user to obtain the amplitude, the phase, the real and imaginary parts of the computed signal. Two cursor modes are available, one which enables to display these values for every probe position, the other to obtain automatically the maximum. This tool can be activated from the "Image tools" menu (2nd icon, cf. image below). It enables to obtain the values measured from the origin of the impedance plane. 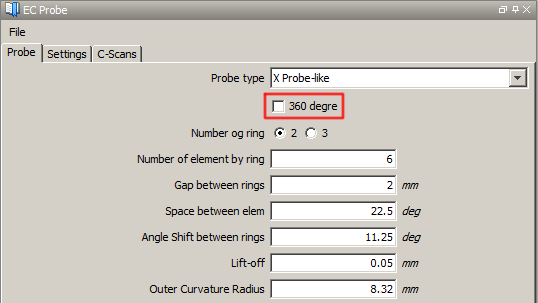 Values at the different positions of the probe can be obtained by moving the cursor which controls the probe position (from the 3D view, or with the vertical cursor of one of the analysis curves), these values are given in the "Amplitude" part of the tool bar. The maximum amplitude can be obtained by moving manually the cursor at the position corresponding to the maximum amplitude of the signal in the impedance plane. Another cursor mode is also available in CIVA, the double cursor mode. It enables to automatically obtain the maximum amplitude of a signal. This mode can be activated from the "Image tools" menu (the 1st icon allows you to switch between single cursor and double cursor mode). In this mode, the user can select two probe positions thanks to two cursors; the maximum amplitude of the signal between the cursors and its phase are then automatically given in the "Measurement" part of the tool bar. With the "Absolute" measurement mode, the measured amplitude corresponds to the amplitude of the signal from the origin of the impedance plane, as for the simple mode cursor. With the "Relative" measurement mode, which corresponds to a measure in differential mode, the given amplitude corresponds to the peak to peak amplitude of the signal. 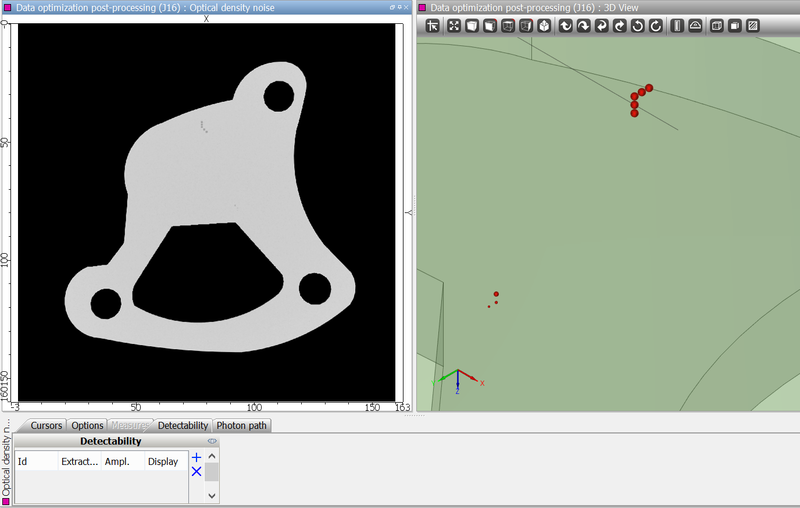 Since CIVA 11, it is possible to import into CIVA RT-CT and CIVA UT several 3D CAD files in the same configuration. 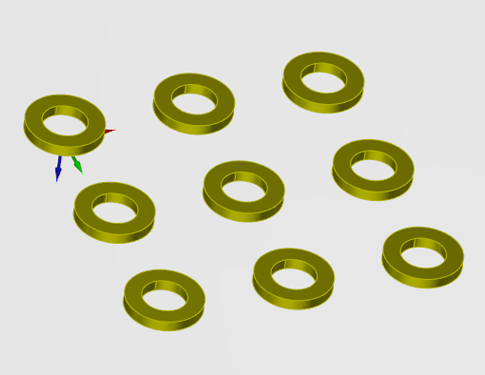 You can also export parametric or 2D CAD files from CIVA as 3D IGES files, in order to reload them together in the 3D CAD interface, or for any other purpose! After performing a simulation, CIVA usually displays reconstructed views or true scans. You may need to change the reconstruction for a better understanding of the results. CIVA 11 proposes a new way to realize this process. 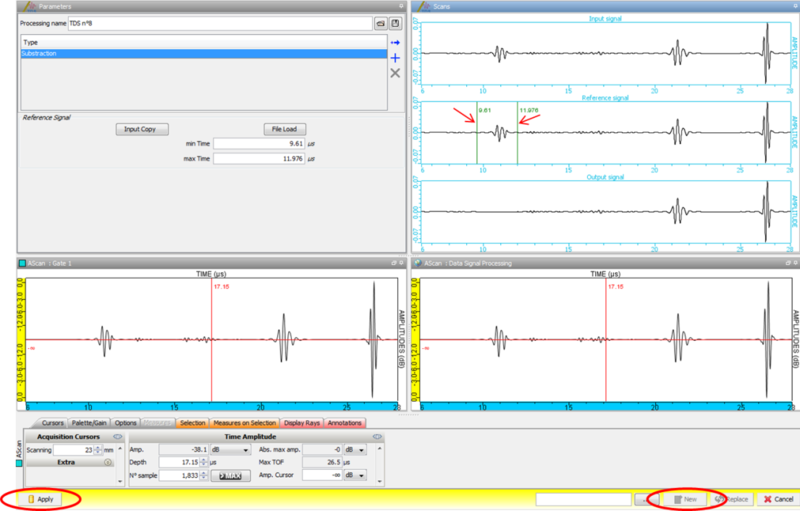 The “Propagation mode” option allows reconstructing the data according to the T wave mode (red ray) or the L wave mode (green ray). Thus, the echoes are positioned in the reconstructed view according to the path and the velocity of the selected mode. In some cases, typically for inspection configurations after skip on the backwall, to display the results, it may be useful to use a “mirror effect” on the backwall. To do that, tick “Reflection” as shown below. CIVA has a CAD drawing tool that enables you to build the specimen to be inspected. Color coding is used to specify the nature of the elements drawn. 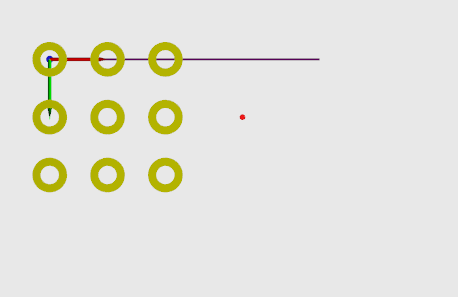 The red color indicates a surface, blue indicates a side, the backwall is drawn in green and interfaces in yellow. By default, the profile extrusion is along the Y axis. 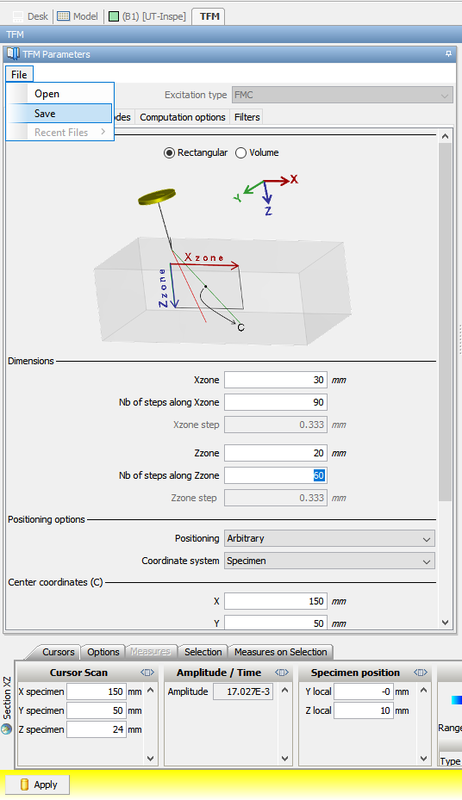 An extrusion along the Z axis enables the simulation of an inspection from the extruded face. To do so, draw all the surfaces of the profile to be extruded in blue (side) or green (backwall). The color should be chosen according to the simulation settings. In the example below, the hole is drawn in green so it is possible to calculate echoes after skips on its surfaces. The CIVA ATHENA2D module enables you to store beam snapshots that can be used to generate a video of the of the beam/flaw scattering. Such a video might be very interesting to visualize the physical phenomena that are created when the field interacts with flaws and/or specimen boundaries. With CIVA 11, a new licensing system, based on the “Sentinel LDK” technology, has been deployed. In particular, the soft key system, or “SL key”, now allows you to install a license without the need for hardware to be received. One benefit of this system, apart from the reduction of environmental impacts (no USB key, electronic “shipment”, etc. ), is to limit the problems due to a broken or lost hardware key. An SL key is installed on a given machine from a *.C2V file, which includes the software footprint of this computer. 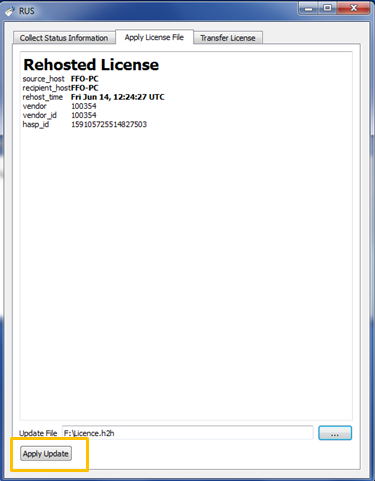 But once installed on this machine, the licence is still movable, and can be transferred with a few clicks: this is the “Rehost” process, described below. 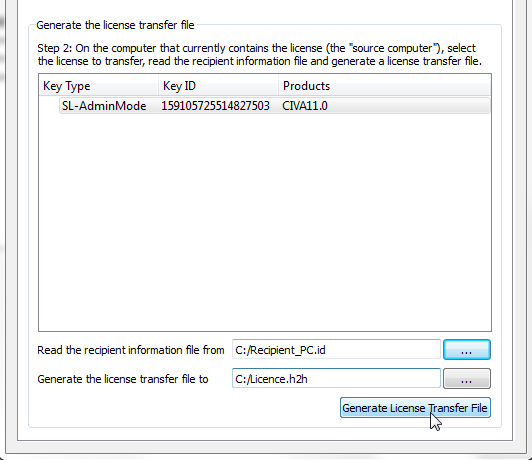 Once the license is transferred, any future update will be done on the new machine currently hosting the license, without the need to reinstall it on the initial machine or to send the footprint file again. If you know you will change the computer on which you run CIVA, remember to transfer your CIVA license thanks to this operation before leaving your machine! With the browser, select and save a relevant name (machine name for instance) and location for your *.id file then select “Collect and Save information”. In case of a future Rehost operation on this machine, this *.Id file can be re-used. Therefore, think about saving all the *.Id files of your machines in a relevant and centralized way, so that you will not have to do this first step again in the future, and be able to start directly at step 2! This *.h2h file is only valid for one transfer in one direction. It can be deleted afterwards, but be careful not to lose it now, as it holds your CIVA license! On the new machine, copy the *.h2h file and, still from the RUS, apply this *.h2h file in the tab “Apply license file – Apply update”. The license is now active on the new machine! Attention! This new feature, available in CIVA 11, potentially allows great things! 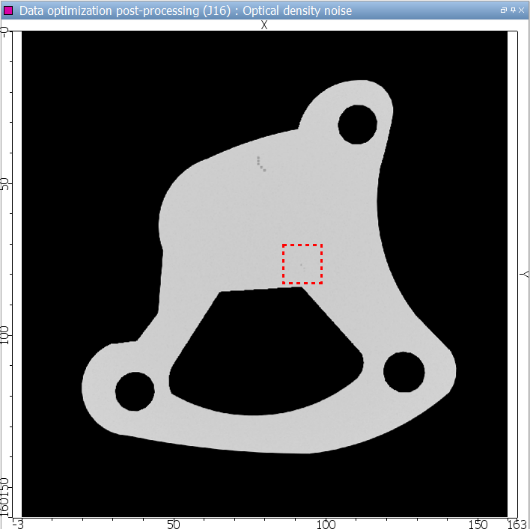 When you perform a simulation with CIVA, the model (geometry and material of the test piece, probe, flaw, etc.) is as close as possible to the actual configuration. For example, if you describe a component with an anisotropic cladding, you define the test piece with the two layers and you take care to define the anisotropic properties of the cladding. 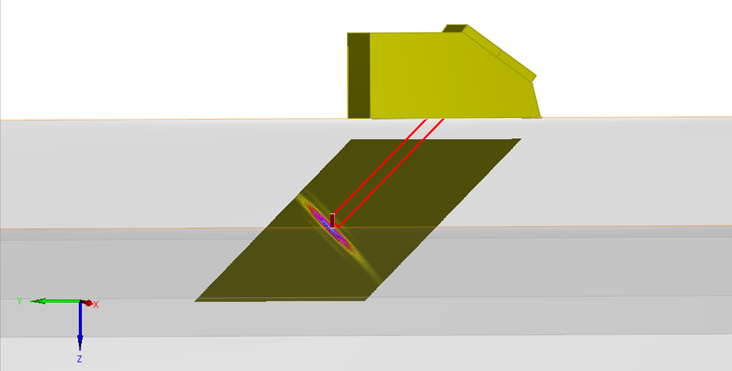 Once the calculation is done, CIVA allows you to reconstruct data in the coordinate system of the work piece accounting for anisotropic properties of the cladding and thus implicitly the resulting beam deflection. So you get a very accurate repositioning of indications, which lets you know exactly what the position of the defect is. 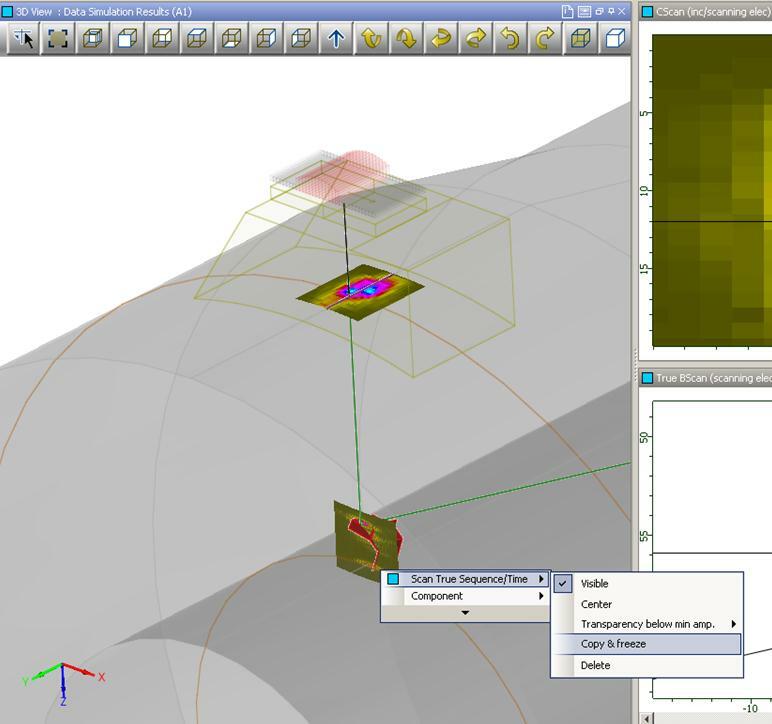 You can then reopen the saved file, which is now interpreted by CIVA as an “acquisition” file, in which it is possible to modify the model parameters and apply the new parameters without having to run a new simulation. In our example, we simply modify the material of the cladding to the same material as the rest of the test piece, and press the “Apply” button at the bottom right of the 3D visualization window. Finally, when you open the reconstructed Bscan image and display it in the 3D view, you get the picture below which no longer reflects the influence of the cladding. This trick will enable you to be able to easily compare an image obtained during an acquisition with the CIVA reconstructed image under the same conditions, while having done the calculation with a specific model as close as possible to real conditions. This example demonstrates the advantage of this capability. It can be applied in many cases, what is the impact of an inappropriate delay law? A specific geometry not taken into account? An attenuative material or deflection of the beam? We trust you to use this feature and utilize all the benefits from it. After performing a beam computation with CIVA or a beam extraction within CIVA-ATHENA2D, the software displays by default for each computation point the maximum amplitude of the received beam. On the following figure, the beam extends from the probe to the specimen backwall. The visualization of the beam propagation is necessary for some configurations, in particular to illustrate some phenomena with CIVA-ATHENA2D. To display it, switch in the data tools from Amax to A(t). The obtained 2D image depends on the time. Adjust the time cursor of the A-scan to visualize the propagation at different times of flight in the 2D image or the 3D view. It is also possible to generate a video file by clicking on the dedicated button. 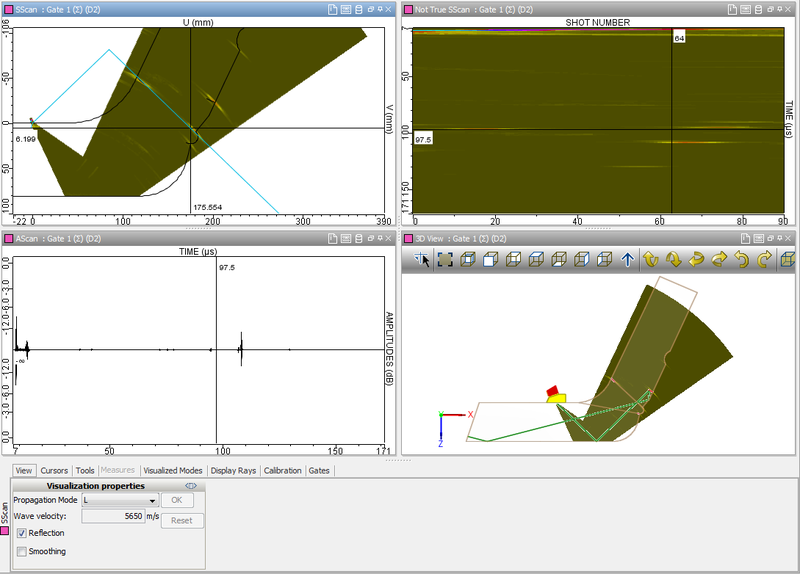 Once you have performed different simulations, you may need to display them side by side for comparison purposes. To do so, open a new analysis page. Then click on the first result. The scan explorer displays the available images. 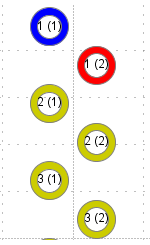 The green circle stands for an image already displayed in an analysis page, the red square for an image not yet displayed. Now click on another result, you can drag and drop other images. A grey rectangle stands for the future positioning of the dragged image in the page. You can drag and drop images from as many results as you want. Each image has a color icon referring to the corresponding result. Additionally, it is possible to superimpose the curves having the same axes (time, scanning steps, scanning increments…). Click on a curve, drag it over another curve and release it. Use the double cursors for a quick measure of the differences. 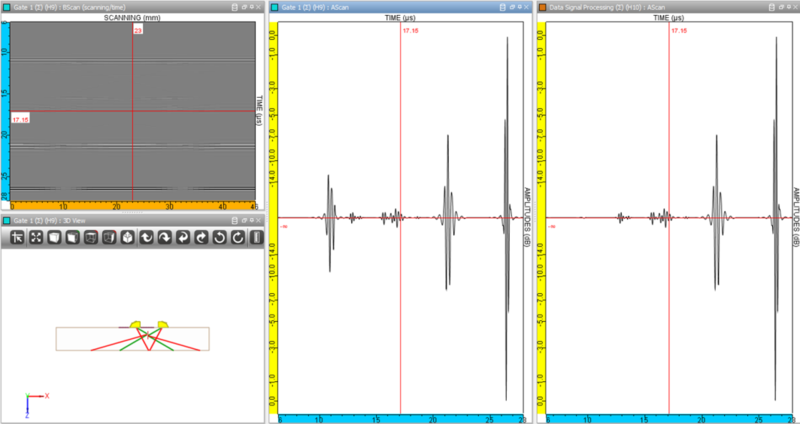 In CIVA 11, a new tool facilitates the interpretation of the various echoes of a Bscan through mode and path identification. To use this tool, the “Identification mode” must be activated in the model. It is available in the “Option” tab under the “Simulation settings” panel. 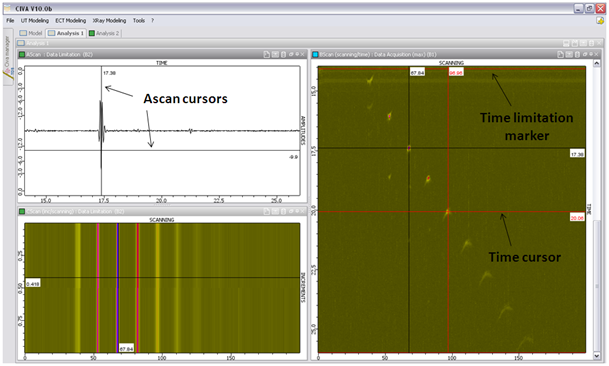 To identify the simulated echoes on the Bscan or True Bscan, select them with the selection tool accessible in the data toolbox. 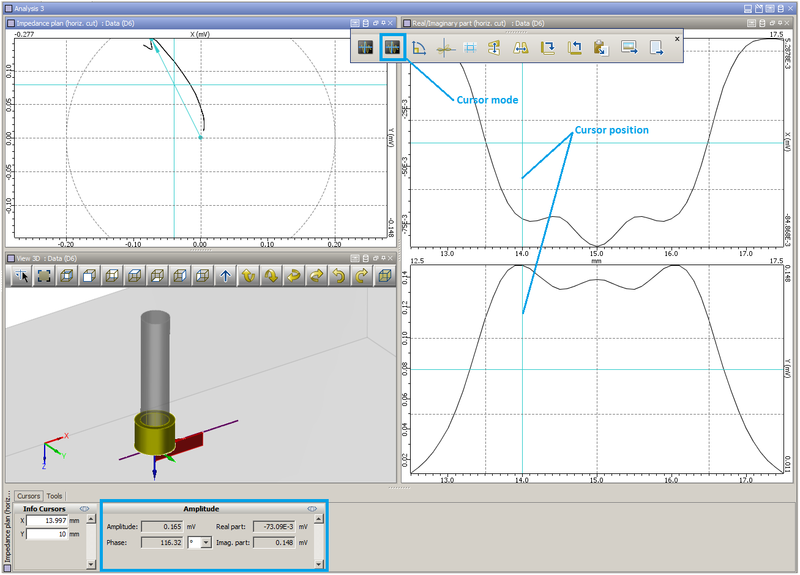 Once the tool is activated, the contour of the zone is drawn with successive clicks. To stop drawing the zone, double-click on the last point of the zone. The modes and their relative contributions in the formation of the echoes in this zone are displayed as shown on the following image. The name of a mode refers to its path. After activating this tool again, it is possible to draw multiple mode identification zones. A right-click on a zone allows the user to remove these zones (choice “Remove” or “Remove all”). It can be useful during analysis to reduce the studied data set. The following acquired results deal with responses from different Side Drilled Holes in a calibration block. This example focuses on the responses from the 3 SDH on the top right of the main B-scan image. After zooming in any view that is not a reconstructed view (A-scan, B-scan, C-scan, echodynamic…), the magic button “Convert zoom to limitation” is available from the data tool. A new dataset appears in the current configuration tree of Civa manager. 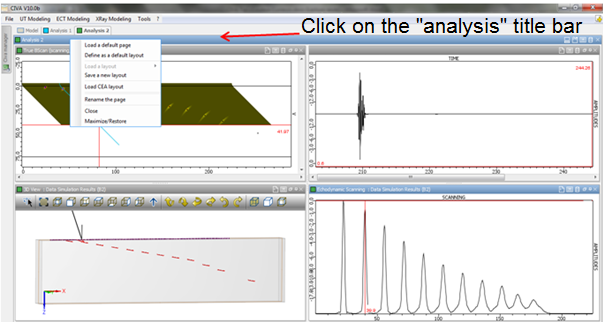 It is then possible to display the limitation result in a new analysis page. 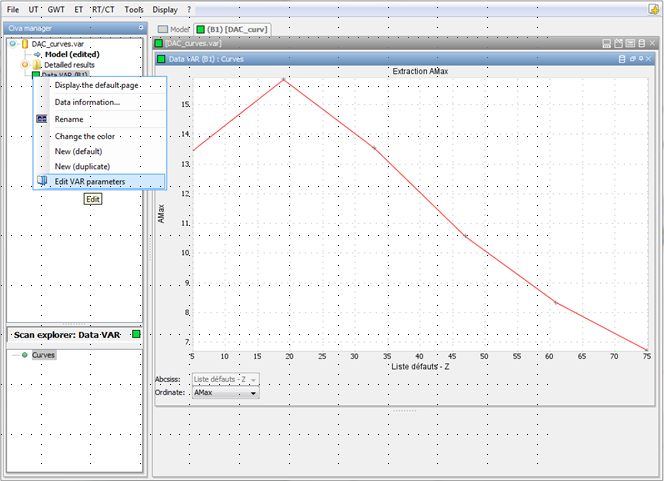 The limitation parameters are displayed in an additional view on the left of the CIVA window. The values correspond to the limits of the not True view from which the “Convert zoom to limitation” button has been applied. A red rectangle also displays the limitation in the original B-scan. 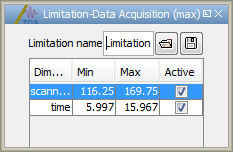 The limitation can be adjusted by dragging the limits of the rectangle or entering values in the previous window. For an easier analysis, it is possible to save only the limited data. Then, one can load only the useful information, and for example apply signal processing. 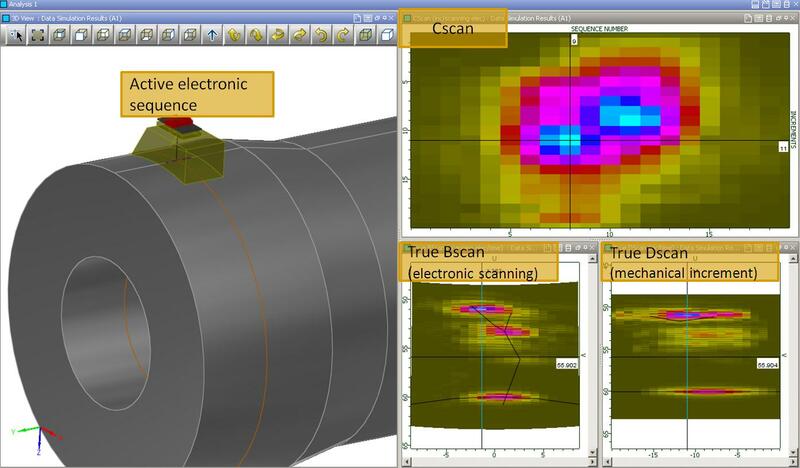 In order to increase the resolution a posteriori of a defect response result in CIVA Eddy Current, the user might wish to smooth a simulated C-Scan. It can help to present the results in a more understandable way while limiting the amount of calculation points and time. Of course, as smoothing is based on an interpolation of the available results, the user has to pay attention to have calculated enough points, in order to avoid introducing artifacts in the smoothed C-Scan. But it might also be useful to test through simulation if one signal will be correctly defined after interpolation, in order to determine the number of necessary acquisition steps and the relevant testing speed for a given probe and a given expected type of defect. To smooth a C-Scan in CIVA ET, right click on the raw C-Scan then select “Interpolation”. It is different from the smoothing of a field computation image (UT or ET) which is done from the “Image Tools” toolbar on the top of the image. 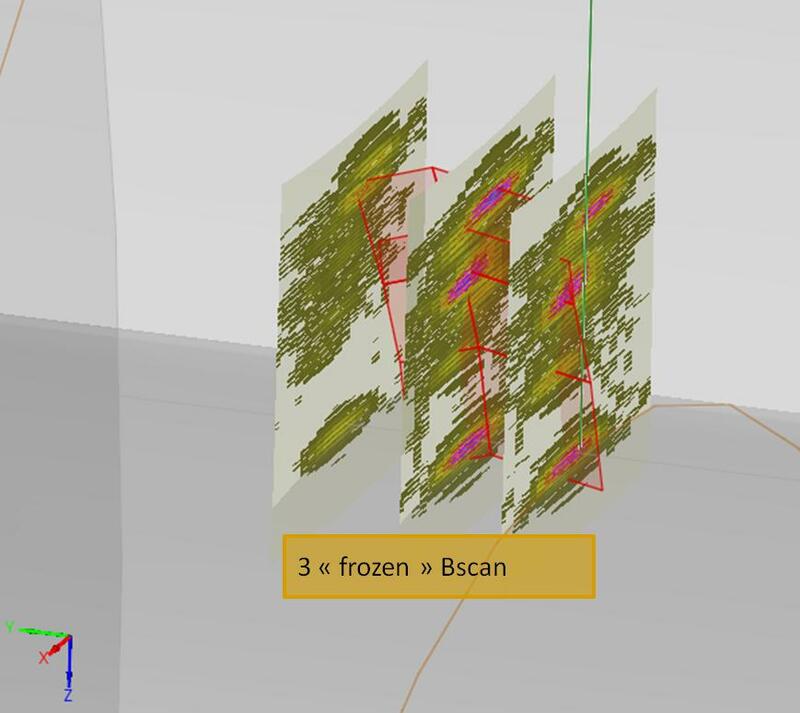 Then, the C-Scan is duplicated in the current page and, in the toolbox at the bottom of the window, 3 interpolation functions are proposed to the user: Linear, Spline and Cubic (actually Cubic Spline). Cubic Spline algorithm is quite popular as an interpolation function; this choice is sometimes detailed in analysis procedures. Once the algorithm is selected, the results are interpolated and represent a certain number of points defined by the user along each axis of the C-Scan. The more points you have, the thinner resolution you get. Different results are presented below for a different amount of points. In addition to the Smoothed C-Scan, CIVA ET creates in the meantime a full set of data in a second analysis page. 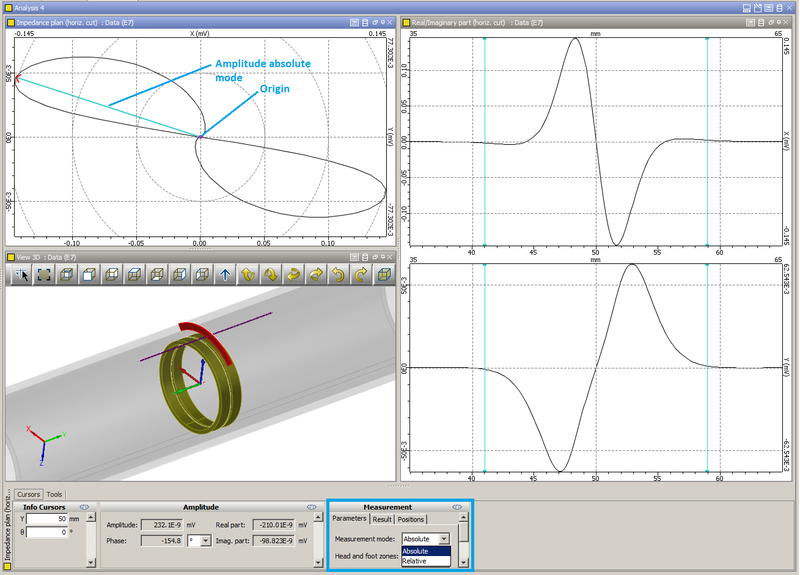 Therefore, the user can also display the associated curves based on the same interpolation: Impedance plane, X and Y channels, Amplitude and Phase curves. In CIVA, unlike in other NDT simulation softwares, the ray tracing is only used to help displaying the results, while the computation relies on the pencil method. 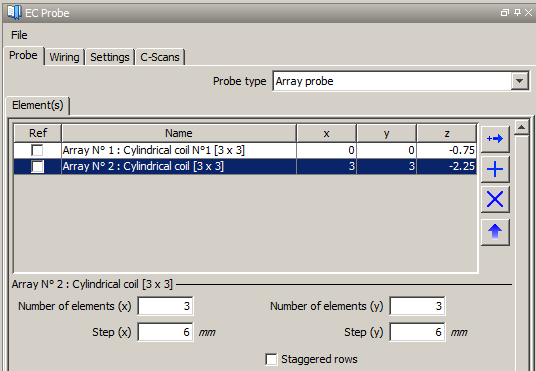 In CIVA UT results, the rays are displayed from the center of the probe to the specimen, according to the local properties at interfaces. For a better understanding of the propagation, it is possible to display a beam of rays. 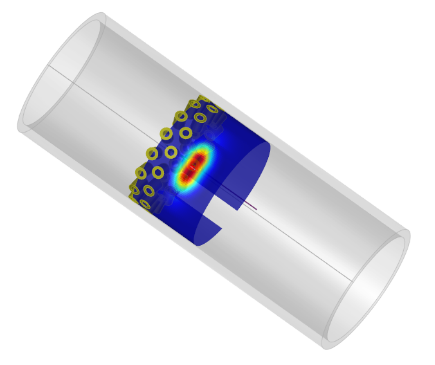 These tools help to visualize the path of the ultrasonic beam. They are used for the reconstruction of the true scans only. CIVA models are based on the pencil method, in which matrices take into account the propagation in each medium and at each interface from a source point. The field radiated by the total aperture of the probe is obtained by a sum of the fields on the different source points constituting the probe. This method is therefore able to compute the time of flight, the polarization and the divergence of the beam. A full RT computation needs to take into account the direct radiation, but also the scattering effect. 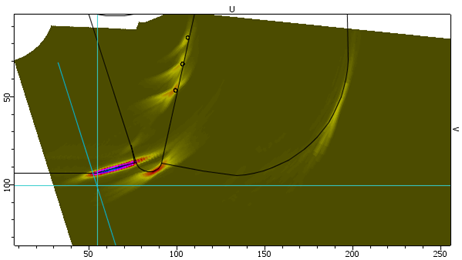 In CIVA, the interaction of the photons with the inspected specimen is simulated with a Monte-Carlo method, in which a given number of photons to be simulated must be defined. The Monte-Carlo computation may take several hours. After performing a simulation taking into account the direct and scattered radiation, the current version of CIVA allows to re-use the already computed Monte-Carlo for other simulations. You may need to change the flaw position, dimension, or other parameters. 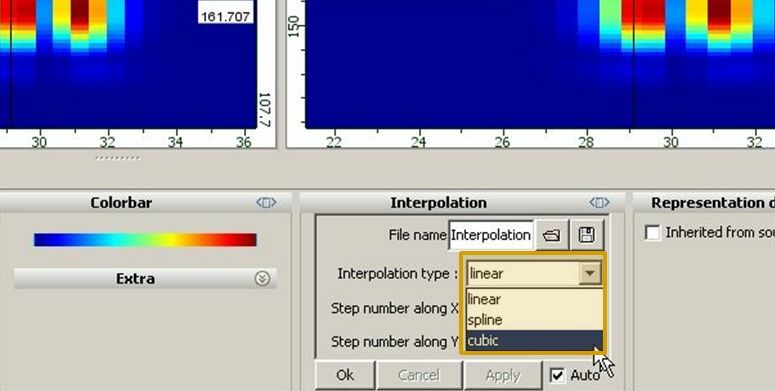 The “import Monte-Carlo computation” option allows the user to change one or several parameters of the model, and to keep the same scattered radiation than for the first computation. CIVA will then compute only the direct radiation, and combine it with the scattering gotten from the loaded Monte-Carlo file. 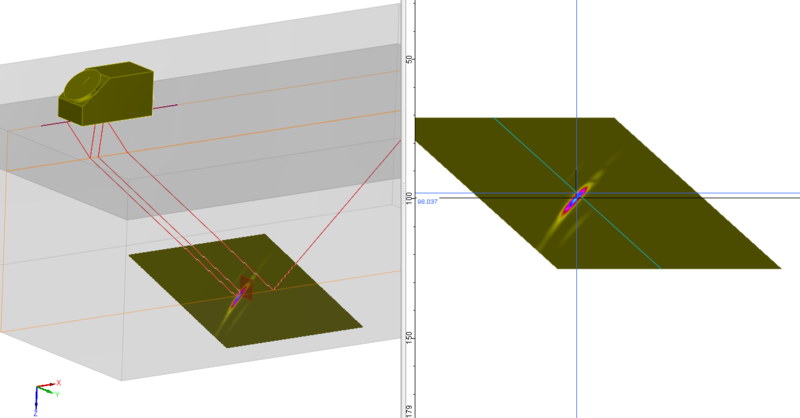 The image below represents a comparison of two simulations with two different sizes of inclusions. The first computation has been simulated with 10E9 photons (5 hours for the computation). In the second one, we loaded the Monte-Carlo from the first result (2 minutes for the computation). This tool is only available when keeping the same detector resolution and size. When using this tool, the user must be sure that the scattering effect will be the same in the different configurations. 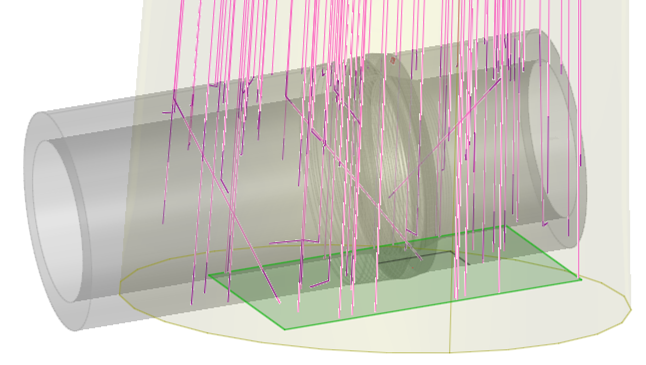 When simulating an inspection with several axis of variation (Mechanical Scanning, Increment, Electronic Scanning, Multiple shots, etc. ), a C-Scan image is generated, and you may wish to display several scans in the 3D view. 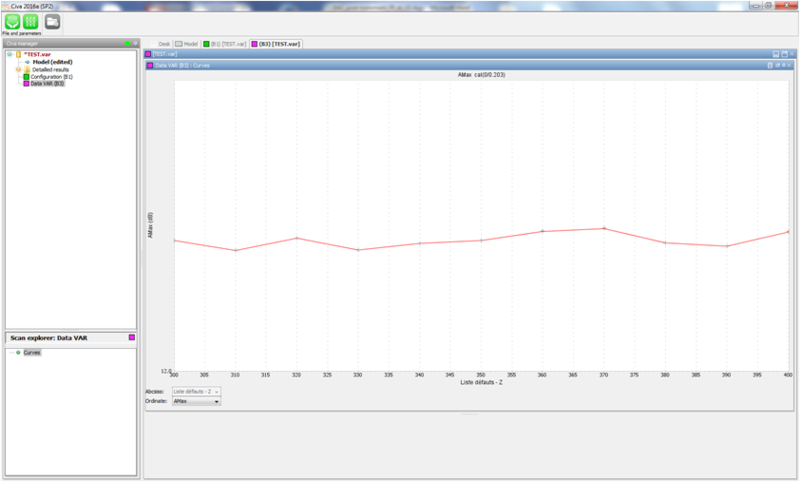 Then, you can see at a glance how one scan is affected by the change in the other axis. This advanced imaging capability facilitates a quick analysis of a given inspection, especially for complex flaw geometries, or when operating several series of shots with a PA probe. 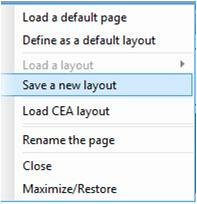 After running one simulation, a default layout (called “CEA layout”) is displayed. 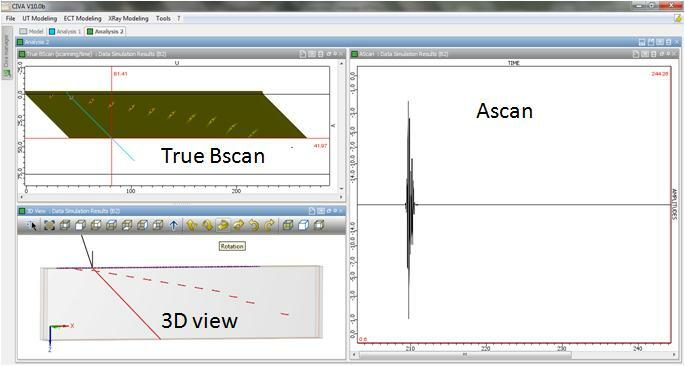 For instance, in the defect-response module of CIVA, the resulting analysis page shows the so-called “true Bscan” (or Sscan for phased array techniques), the 3D view and the Ascan. 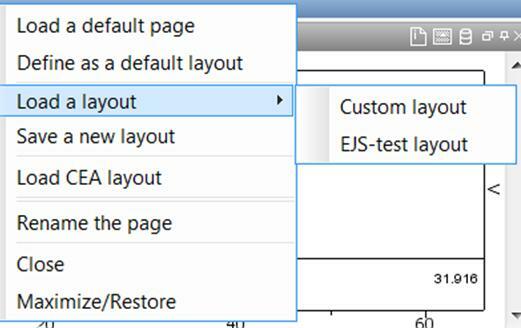 However, when opening a result, you may want a specific layout for the analysis page, adding for instance a new image. CIVA offers the possibility to customize the arrangement of the different images displayed for your convenience. For each new result displayed in a new analysis page, you will then be able to recover the specific layout. To do that, you just need to define your new layout, and then right click on the blue “analysis” title bar at the top of the window. Save this new layout. Each time you wish to recover this specific arrangement, you will just have to load this layout. Define this new layout as the default layout. This new arrangement will be the one used for all new results displayed. Several layouts can be saved. 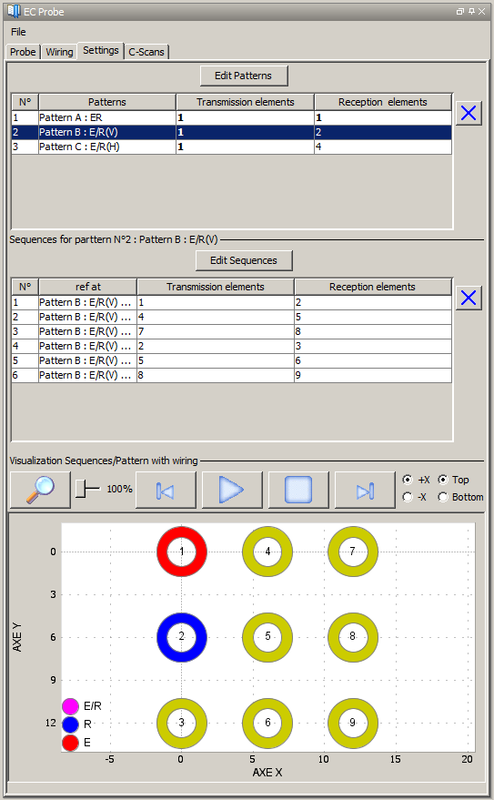 You will be able to select your favorite layout for different simulation results. At last, your analysis environment is really organized as you wish! 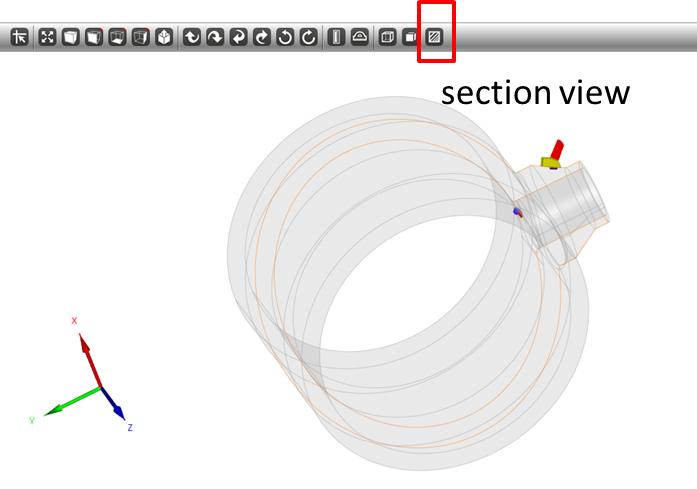 In CIVA 10, the concept of cross section views has been developed, in order to easily switch from 3D viewing into a specific 2D display. Those views are available by right clicking either on the probe or on a defect. 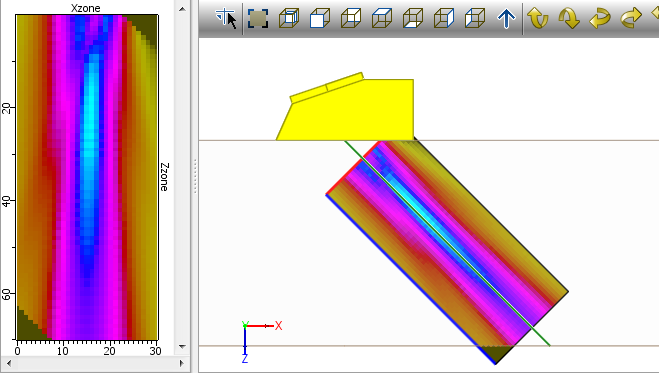 Then, some menus allow you to select typical 2D cross section views regarding the selected object. 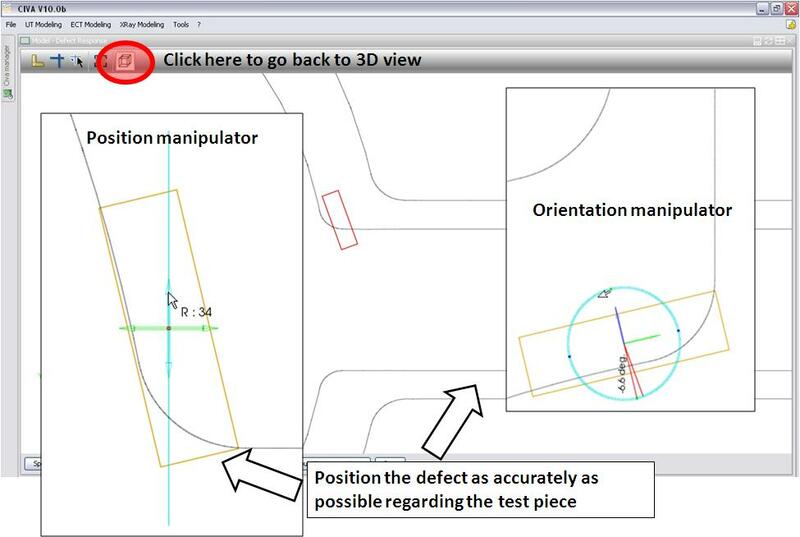 For instance, if you select a so-called “parallel section view” available from the flaw, you will immediately visualize the cross section view between the test piece and the flaw plane. From this new view, you are allowed to double click on the flaw to activate its interactive positioning mode, and you can easily translocate and/or rotate this flaw to put it exactly at the expected position. 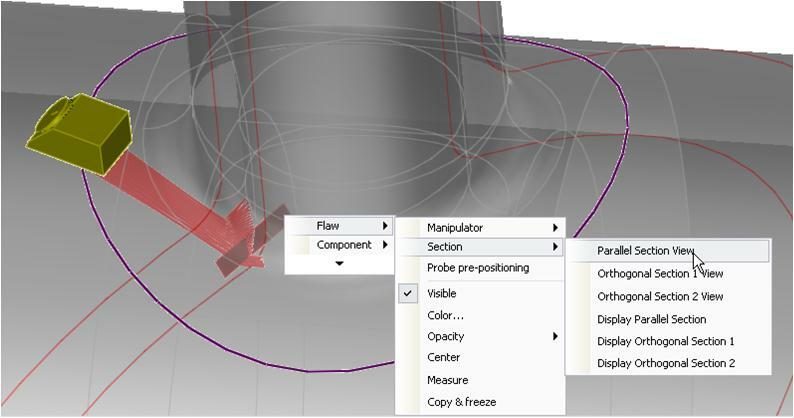 You can finally go back to the 3D view with a simple click on the appropriate button, and adjust other parameters before running your simulations. That is definitely one of the best functionalities that has been provided in the CIVA 10 release, isn’t it? When analyzing a great amount of data, any CIVA user obviously complained because the color of cursors in images was not convenient! What is more bothering than a cursor which color is exactly the same as the Ascan color? Why does the second red cursor have exactly the same color as limitation markers? Well, in the CIVA 10 release, it is now possible to customize cursor color or even image backgrounds, so that all those annoying things will not disturb you anymore! To change the cursor’s color, nothing easier! You just need to open the “Tool > Preferences” menu, and select the “Colors” section. At last your analysis environment is far more comfortable! 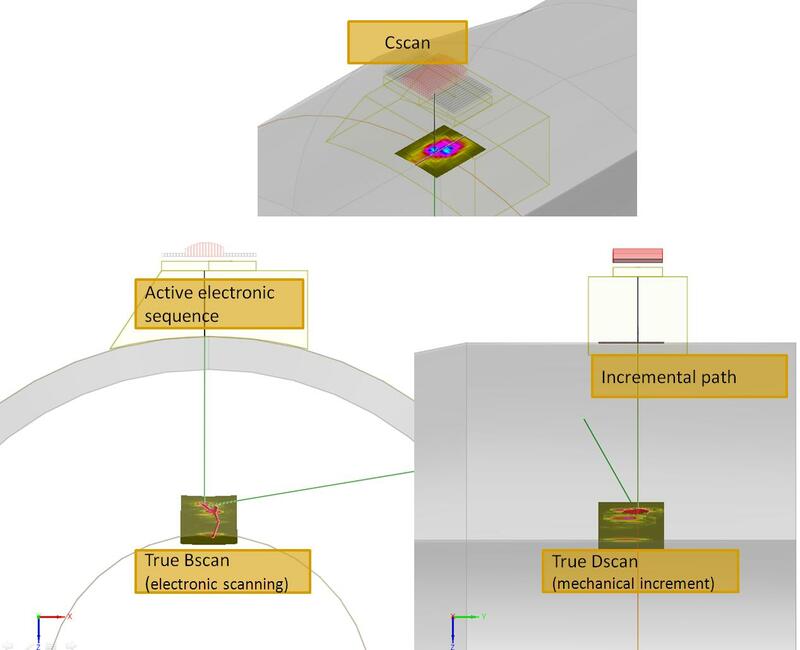 When performing a phased-array inspection involving different sequences or shots for one or several mechanical scanning position, you can cumulate the views from all “Scan” or true “Bscan” in a single image. For both of these options, the resulting image contains the complete data displayed in the image. 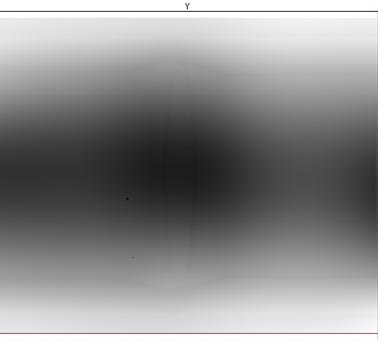 “Merged” image means that, for each pixel of the image, the amplitude displayed corresponds to the maximum amplitude obtained in this region (if several shots correspond to this location), whereas “Mean Merged” image corresponds to the average of all shots for each pixel of the image. This is not a new feature in CIVA but it remains quite unknown : This is possible to save all the parameters of your transducers in a set of different files in order to build your own library of probes, ready to load in Civa. 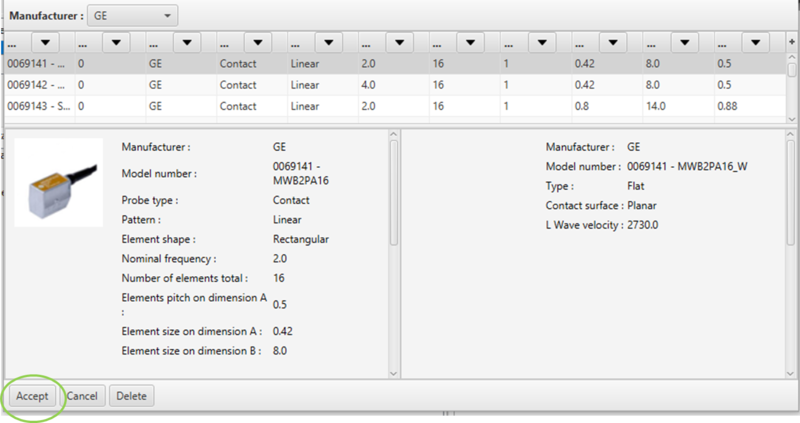 You can really save time using this feature as this is not so easy to access to the information relative to the probe parameters (geometry, focusing, signal,…), so… just look at the manufacturer data sheet once! This is also an interesting feature in order to share the knowledge with your colleagues and to avoid to make some mistakes when entering input data. How to do that ? Really simple! Once you have filled all the information in the probe panel, just select the menu “File” then “Save” on the top left side of the panel. Then, enter a name (well… let’s put clearly the probe reference!) and save the information, this is just a simple file that you put on your disk. 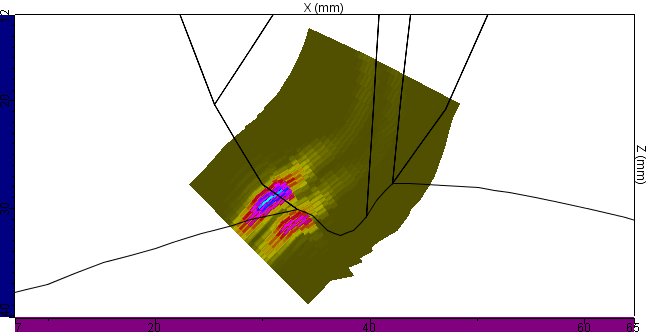 CIVA 10.0 provides a new tool to make efficient amplitude measurements on images. Most commercial tools provide such a possibility but in square areas. In the image above, it seems difficult to make an efficient measurement with a square around the tip echo (where cursors cross)! 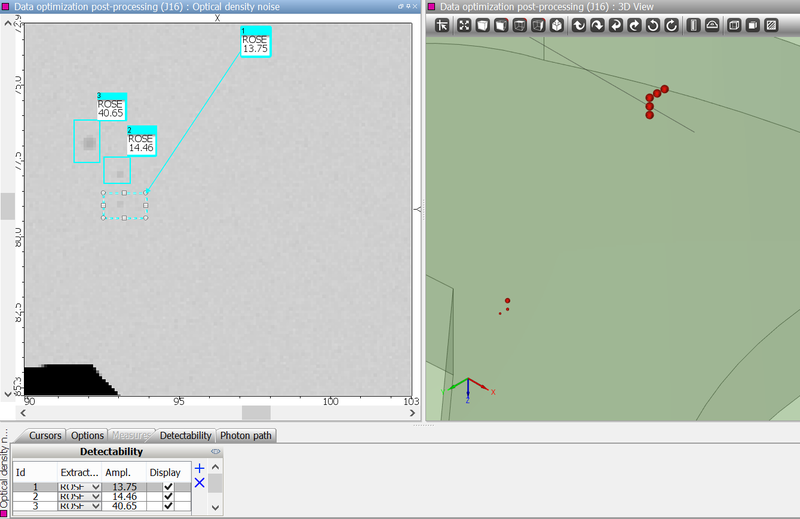 CIVA allows the user to create a free multi point area as shown above, by clicking on the button in “data tools” available in title bars for all images. A cross indicates the position of the maximum amplitude point in this area and a box appears and gives all available information. 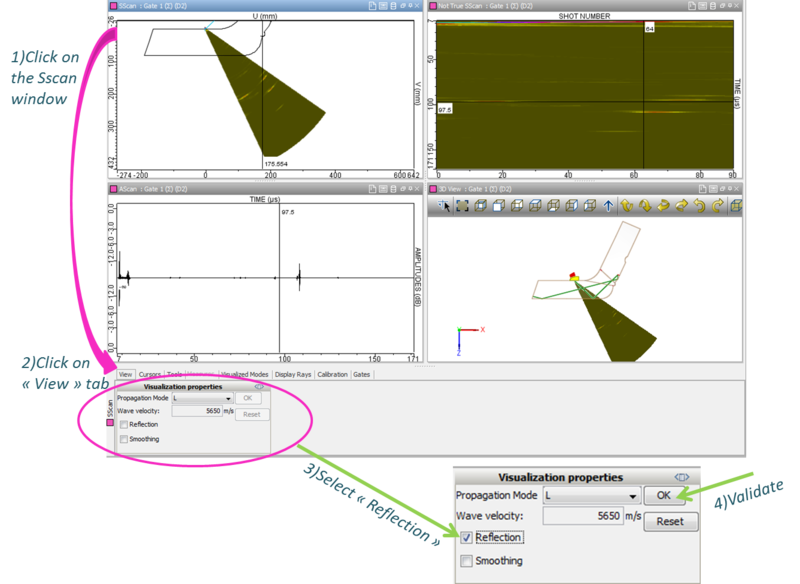 Moreover, by double clicking on the area contour, the contour shape can easily be modified. This can be applied on Bscans, Cscans and so on.